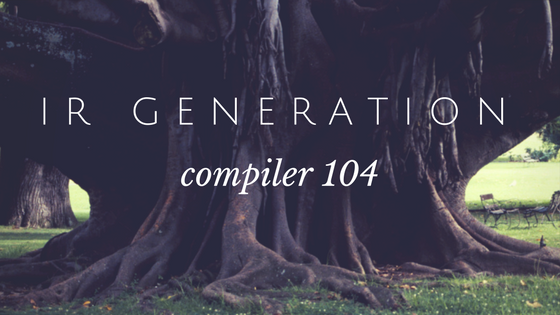 Now that the Semantic Analyzer has verified that the code is actually correct and created syntax trees, it’s time to talk about IR generation. After the Semantic Analyzer, the next step is to turn the trees that it validated and added type information to into a representation that is much closer to what the machine is actually going to generate. This representation is called an intermediate representation (IR). The Xojo compiler, when building for 64-bit or ARM, uses LLVM IR. The resulting LLVM IR describes the actual control flow of the program and every single thing that will be in the final program. In addition to the user-visible code that gets executed and the implicit conversions that are now in the trees, it also needs to contain all of the hidden, behind the scenes calls like reference counting and introspection metadata. LLVM IR is actually higher level and more abstract than the actual assembly that it’ll end up generating. For example, unlike assembly language, it’s entirely strongly typed and the Xojo compiler has to be very precise in what it generates (which is a good thing!). To generate IR, the compiler walks through the above tree, depth first, to get to the leaf nodes. Doing this gets us to the BinaryOperator* for the multiple on the lower right side of the tree. The sitofp IR command means “Signed Integer to Floating Point”. The fadd IR command means “floating point add”. The fptosi IR command means “floating point to signed integer”. Reading through this you should now understand why no one wants to manually write code at such a low-level. This is the last part of the compiler that is considered to be part of the front end. The rest of the compiler components belong to the back end.